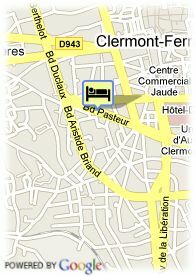 46 Boulevard Pasteur, 63000 Clermont-Ferrand, Frankreich. 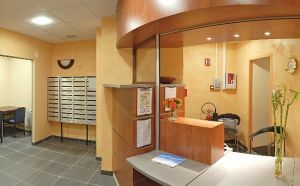 Appart'City Clermont-Ferrand Pasteur offers you, in a "sea horizon decor" some furnished and fully equipped apartments for 1 to 4 people, warm and sophisticated living areas where you will find comfort, welfare and relaxation. Internetleistungen und WiFi sind gegen Zahlung vorhanden. Bezahltes überdachter Parkplätze beim Hotel, Bezahltes open air Parkplätze beim Hotel (6.00 €), Reservierung erforderlich. Bahnhofsnähe, Stadtzentrum, in der Nähe der U-Bahn / Strassenbahn. On the Boulevard Pasteur, the main boulevard in the city centre, Appart'City Cap Affaires Clermont-Ferrand Pasteur blends in perfectly with the stately buildings from centuries past. With the tramway just outside, the residence provides easy access to the administrative services and business parks.